When you add a test target to a project with the test navigator, Xcode displays the test classes and methods from that target in the test navigator. In the test target are the test classes containing test methods. This chapter explains how you create test classes and write test methods. Before looking at creating test classes, it is worth taking another look at the test navigator. Using it is central to creating and working with tests. Adding a test target to a project creates a test bundle. The test navigator lays out the source code components of all test bundles in the project, displaying the test classes and test methods in a hierarchical list. Here’s a test navigator view for a project that has two test targets, showing the nested hierarchy of test bundles, test classes, and test methods. Test bundles can contain multiple test classes. You can use test classes to segregate tests into related groups, either for functional or organizational purposes. For example, for the calculator example project you might create BasicFunctionsTests, AdvancedFunctionsTests, and DisplayTests classes, all part of the Mac_Calc_Tests test bundle. Some types of tests might share certain types of setup and teardown requirements, making it sensible to gather those tests together into classes, where a single set of setup and teardown methods can minimize how much code you have to write for each test method. Note: This chapter focuses on unit test classes and methods for purposes of illustration. Creating UI test targets, classes, and methods, and how that differs from working with unit tests, is discussed in User Interface Testing. You use the Add button (+) in the test navigator to create new test classes. 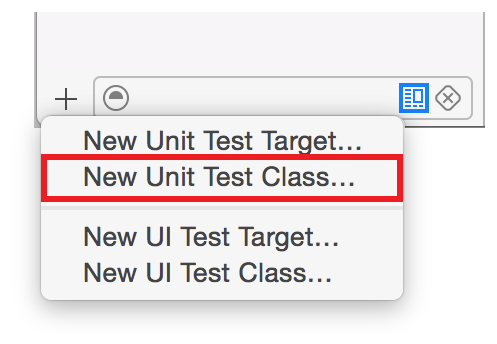 You can choose to add either a Unit Test Class or a UI Test Class. After choosing one of these, Xcode displays a file type selector that has the chosen type of file template selected. A “New Unit Test Class” template is highlighted in the illustration below. Click Next to proceed with your selection. Each test class you add results in a file named TestClassName.m being added to the project, based on the test class name you enter in the configuration sheet. Note: All test classes are subclasses of XCTestCase, provided by the XCTest framework. 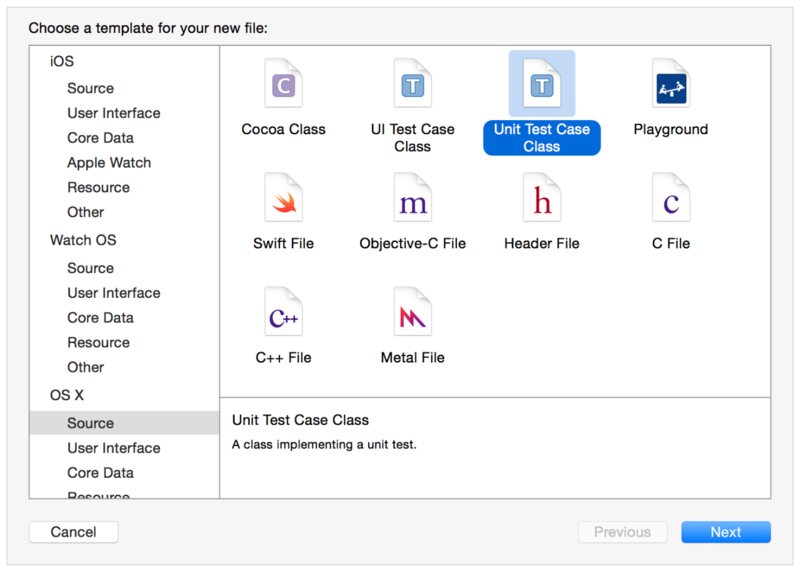 Although by default Xcode organizes test class implementation files into the group it created for your project’s test targets, you can organize the files in your project however you choose. The standard Xcode Add Files sheet follows this configuration when you press the Next button. You use the Add Files sheet the same way as when adding new files to the project in the project navigator. For details on how to use the Add Files sheet, see Adding an Existing File or Folder. Note: When you create a new project, a test target and associated test bundle are created for you by default with names derived from the name of your project. For instance, creating a new project named MyApp automatically generates a test bundle named MyAppTests and a test class named MyAppTests with the associated MyAppTests.m implementation file. 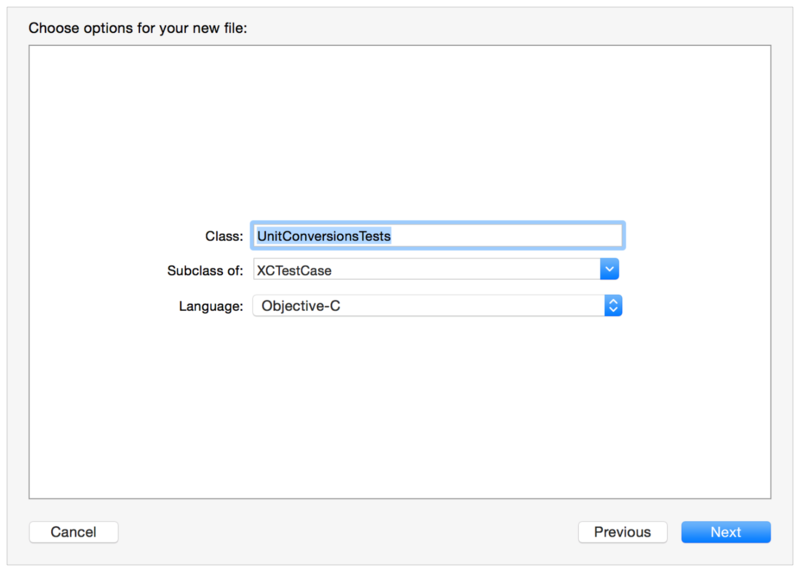 The test class is implemented in Objective-C in this example, but can also be implemented in Swift. Note: The implementation examples in this text are all written in Objective-C for consistency. Swift is fully compatible with using XCTest and implementing your test methods. All Swift and Objective-C cross-language implementation capabilities can be used as well. Notice that the implementation contains methods for instance setup and teardown with a basic implementation; these methods are not required. If all of the test methods in a class require the same code, you can customize setUp and tearDown to include it. The code you add runs before and after each test method runs. You can optionally add customized methods for class setup (+ (void)setUp) and teardown (+ (void)tearDown) as well, which run before and after all of the test methods in the class. Note: There are options available to change specifically what tests XCTest runs. You can disable tests using the test navigator or by editing the scheme. You can also run just one test or a subset of tests in a group using the Run buttons in either the test navigator or the source editor gutter. For each class, testing starts by running the class setup method. For each test method, a new instance of the class is allocated and its instance setup method executed. After that it runs the test method, and after that the instance teardown method. This sequence repeats for all the test methods in the class. After the last test method teardown in the class has been run, Xcode executes the class teardown method and moves on to the next class. This sequence repeats until all the test methods in all test classes have been run. You add tests to a test class by writing test methods. A test method is an instance method of a test class that begins with the prefix test, takes no parameters, and returns void, for example, (void)testColorIsRed(). A test method exercises code in your project and, if that code does not produce the expected result, reports failures using a set of assertion APIs. For example, a function’s return value might be compared against an expected value or your test might assert that improper use of a method in one of your classes throws an exception. XCTest Assertions describes these assertions. For a test method to access the code to be tested, import the corresponding header files into your test class. 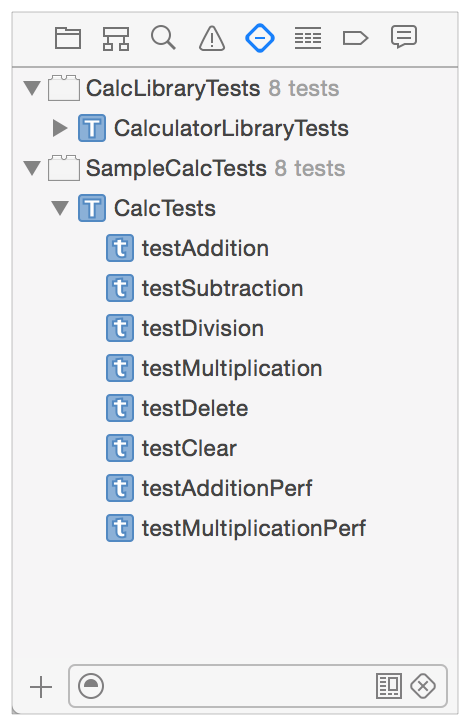 When Xcode runs tests, it invokes each test method independently. Therefore, each method must prepare and clean up any auxiliary variables, structures, and objects it needs to interact with the subject API. If this code is common to all test methods in the class, you can add it to the required setUp and tearDown instance methods described in Test Class Structure. // Test logic and values, assertions report pass/fail to testing framework. // Tear down. (Code could be shared in tearDown method. Tests execute synchronously because each test is invoked independently one after another. But more and more code executes asynchronously. To handle testing components which call asynchronously executing methods and functions, XCTest has been enhanced in Xcode 6 to include the ability to serialize asynchronous execution in the test method, by waiting for the completion of an asynchronous callback or timeout. // Create an expectation object. // This test only has one, but it's possible to wait on multiple expectations. // to invoke its completion handler and then return. // or all expectations are fulfilled. For more details on writing methods for asynchronous operations, see the XCTestExpectation reference documentation. A performance test takes a block of code that you want to evaluate and runs it ten times, collecting the average execution time and the standard deviation for the runs. The averaging of these individual measurements form a value for the test run that can then be compared against a baseline to evaluate success or failure. Note: The baseline is a value that you have specified to be used for the evaluation of test pass or failure. The report UI provides a mechanism to set or change the baseline value. To implement performance measuring tests, you write methods using new API from XCTest in Xcode 6 and later. The following simple example shows a performance test written to test addition speed with the calculator sample app. A measureBlock: is added along with an iteration for XCTest to time. Performance tests, once run, provide information in the source editor when viewing the implementation file, in the test navigator, and in the reports navigator. Clicking on the information presents individual run values. The results display includes controls to set the results as the baseline for future runs of the tests. Baselines are stored per-device-configuration, so you can have the same test executing on several different devices and have each maintain a different baseline dependent upon the specific configuration’s processor speed, memory, and so forth. Note: Performance measuring tests always report failure on the first run and until a baseline value is set on a particular device configuration. For more details on writing methods for performance measuring tests, see the XCTestCase reference documentation. Creating UI tests with XCTest is an extension of the same programming model as creating unit tests. Similar operations and programming methodology is used overall. The differences in workflow and implementation are focused around using UI recording and the XCTest UI testing APIs, described in User Interface Testing. The Swift access control model, as described in the Access Control section of The Swift Programming Language (Swift 3.0.1), prevents an external entity from accessing anything declared as internal in an app or framework. By default, to be able to access these items from your test code, you would need to elevate their access level to at least public, reducing the benefits of Swift’s type safety. When you set the Enable Testability build setting to Yes, which is true by default for test builds in new projects, Xcode includes the -enable-testing flag during compilation. This makes the Swift entities declared in the compiled module eligible for a higher level of access. When you add the @testable attribute to an import statement for a module compiled with testing enabled, you activate the elevated access for that module in that scope. Classes and class members marked as internal or public behave as if they were marked open. Other entities marked as internal act as if they were declared public. With this solution in place, your Swift app code’s internal functions are fully accessible to your test classes and methods. The access granted for @testable imports ensures that other, non-testing clients do not violate Swift’s access control rules even when compiling for testing. Further, because your release build does not enable testability, regular consumers of your module (for example if you distribute a framework) can’t gain access to internal entities this way. Note: @testable provides access only for internal functions; file-private and private declarations are not visible outside of their usual scope when using @testable. Your test methods use assertions provided by the XCTest framework to present test results that Xcode displays. All assertions have a similar form: items to compare or a logical expression, a failure result string format, and the parameters to insert into the string format. Note: The last parameter of all assertions is format..., a format string and its variable parameter list. XCTest provides a default failure result string for all assertions, assembled using the parameters passed to the assertion. The format string offers the ability to provide an additional, custom description of the failure that you can choose to supply in addition to the provided description. This parameter is optional and can be omitted. A test method can include multiple assertions. Xcode signals a test method failure if any of the assertions it contains reports a failure. Unconditional Fail. Use this when simply reaching a particular branch of code indicates a failure. The only assertion in this category is XCTFail. Equality Tests. Use these to assert a relationship between two items. For example, XCTAssertEqual asserts that two expressions have the same value, while XCTAssertEqualWithAccuracy asserts that two expressions have the same value within a certain accuracy. This category also includes tests for inequality, such as XCTAssertNotEqual and XCTAssertGreaterThan. Boolean Tests. Use these to assert that a Boolean expression evaluates a certain way, for example using XCTAssertTrue or XCTAssertFalse. Nil Tests. Use these to assert that an item is or is not nil, for example using XCTAssertNil or XCTAssertNotNil. Exception Tests. Use these to assert that evaluating an expression generates an exception or not. You look for any exception to be thrown with XCTAssertThrows, or you can look for a specific exception with an assertion like XCTAssertThrowsSpecific. You can also assert the inverse, that no exception is thrown when evaluating an expression, using a function like XCTAssertNoThrow. The XCTest Framework Reference contains a complete enumeration of all the available assertion functions. When using XCTest assertions, you should know the fundamental differences in the assertions’ compatibility and behavior when writing Objective-C (and other C-based languages) code and when writing Swift code. Understanding these differences makes writing and debugging your tests easier. XCTest assertions that perform equality tests are divided between those that compare objects and those that compare nonobjects. For example, XCTAssertEqualObjects tests equality between two expressions that resolve to an object type while XCTAssertEqual tests equality between two expressions that resolve to the value of a scalar type. This difference is marked in the XCTest assertions listing by including “this test is for scalars” in the description. Marking assertions with “scalar” this way informs you of the basic distinction, but it is not an exact description of which expression types are compatible. For Objective-C, assertions marked for scalar types can be used with the types that can be used with the equality comparison operators: ==, !=, <=, <, >=, and >. If the expression resolves to any C type, struct, or array comparison that works with these operators, it is considered a scalar. For Swift, assertions marked for scalars can be used to compare any expression type that conforms to the Equatable protocol (for all of the “equal” and “not equal” assertions) and Comparable protocol (for the “greater than” and “less than” assertions). In addition, assertions marked for scalars have overrides for [T] and for [K:V], where T, K, and V conform to Equatable or Comparable protocols. For example, arrays of an equatable type are compatible with XCTAssertEqual(_:_:_:file:line:), and dictionaries whose keys and values are both comparable types are compatible with XCTAssertLessThan(_:_:_:file:line:). Note: In Swift, NSObject conforms to Equatable, so using XCTAssertEqualObjects works but isn’t necessary. Using XCTest assertions in your tests also differs between Objective-C and Swift because of how the languages differ in treating data types and implicit conversions. For Objective-C, the use of implicit conversions in the XCTest implementation allows the comparisons to operate independent of the expressions’ data types, and no check is made of the input data types. For Swift, implicit conversions are not allowed because Swift is stricter about type safety; both parameters to a comparison must be of the same type. Type mismatches are flagged at compile time and in the source editor.